Barge Accident Breakaway risk due to drought, Low River Levels. The inland rivers of America have been used for centuries as part of a transportation network. Lewis & Clark used these “water highways” during their famous expedition in 1803, when they “put in” on the Ohio River in Pittsburgh, Pennsylvania. They navigated the Mississippi and Wood Rivers before exploring the longest river in the U.S, the Missouri River. Today, our inland rivers carry goods and commodities such as oil/fuel, coal, grain, sand, etc., which are all vital to our nation’s economic well-being. However, the recent drought in the Midwest and resulting low levels in the Mississippi River has created cause for concern in the towing industry. On July 26, 2012, the president of Pennsylvania-based Campbell Transportation Company / C&C Marine Maintenance Company was quoted in a story in the Observer-Reporter saying that the situation on the lower Mississippi River is dire. He confirmed that towboat companies are reducing the amount of cargo in river barges for fear that they will run aground and break apart. 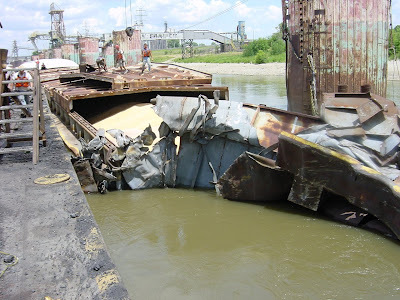 Barges that run aground can break free from their towing arrangements and be swept downriver potentially wreaking havoc to the river system until they are either corralled by towboats or salvaged if sunk. Some break-away barges have damaged other commercial vessels, pleasure boats, dock facilities, bridges and dams, not to mention loss of life. If run-away barges are carrying highly flammable liquids and carcinogens such as benzene (found in coal-tar light oil), home evacuations may be necessary due to the risk of explosion and exposure to toxic levels of cancer-causing chemicals. If you are a pleasure boater, know that the risk of barges breaking away not only exists in high water, but low water as well. Barge accidents can happen at any time. Contact our experienced injury lawyers at The Moschetta Law Firm, P.C. to learn your rights if you have been injured or your pleasure boat or dock damaged by a barge accident or runaway towboat.